When I was a kid in the 1980s, my best friend’s parents had a Chevy Suburban that they used to tow an RV large enough to accommodate their family of five. Having grown up around the small Japanese cars my dad drove, I was amazed by this beast of a truck that, if I recall correctly, I was lucky enough to hitch a ride in just once. 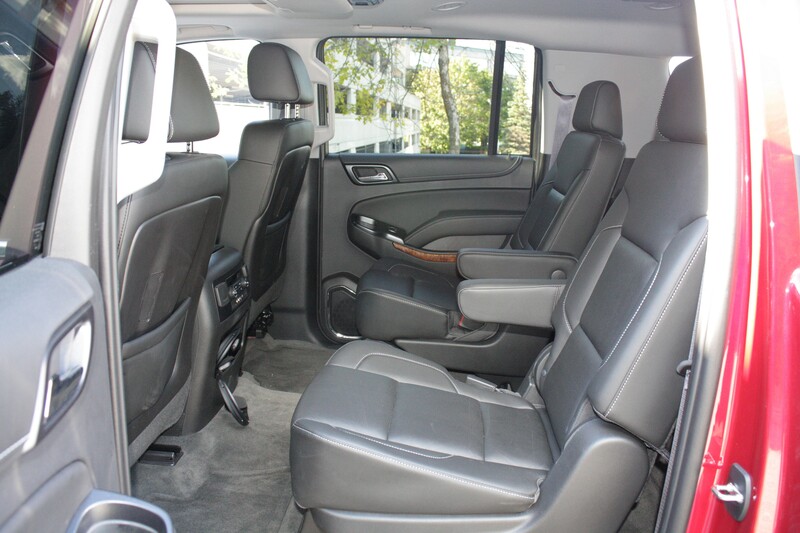 No doubt many other kids and their families have spent time in Suburbans: it’s one of the oldest SUV names in the business, first seen in a showroom in the 1930s. About 80(!) 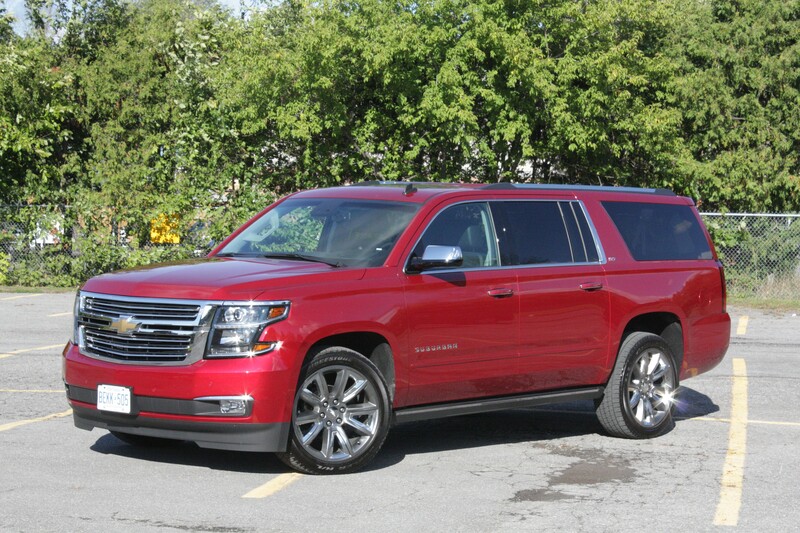 years later, the Suburban carries on, having just enjoyed a redesign into its 12th(!!) generation for 2015. No surprise, the Suburban’s still a big boy, stretching nearly 19 feet long. That, for the sake of perspective, is nearly a foot longer than my little townhouse is wide. All those jokes about piloting a Suburban being like driving around in your living room are suddenly much less funny. 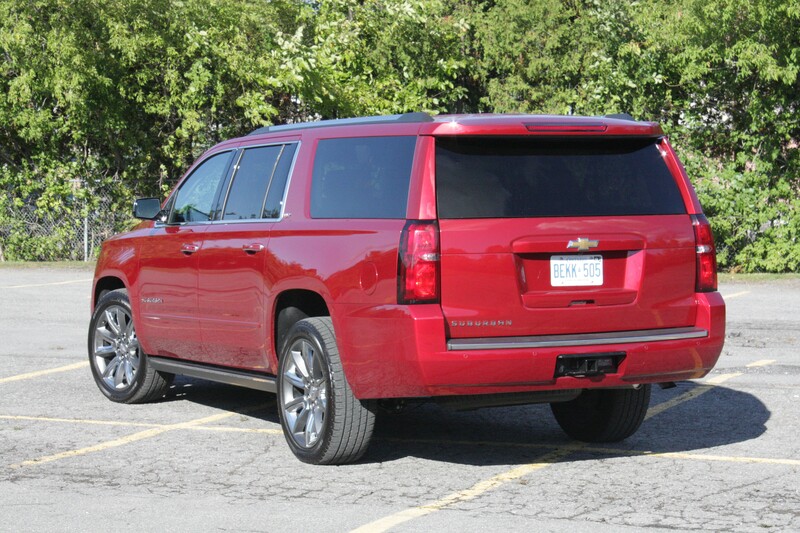 For all its size, Chevrolet’s designers have done a good job masking the Suburban’s bulk. It isn’t until you’re in the driver’s seat and you see, through the rear view mirror, how much SUV there is behind you that you realize how large this truck really is. 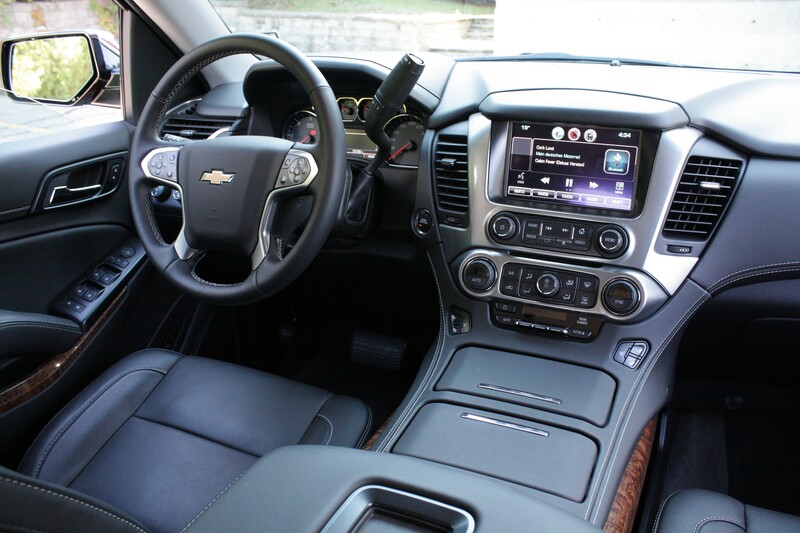 My tester was done up in top-end LTZ trim, including GM’s magnetic ride control suspension, which the company says “reads” the road and adjusts its responses every five milliseconds. That’s a fancy way of saying it makes the Suburban drive like a vehicle two-thirds its size and weight. If you ignore how the heavy rear live axle clomps over rough pavement, the ride is more like that of a big sedan, not a nearly three-ton SUV. Magnetic ride control does wonders in other ways, too: body roll feels nearly non-existent in aggressive cornering, and in a near-panic stop, there was none of the body-pitching-forward drama that normally accompanies that sort of maneuver. Having driven the previous-generation Chevy Tahoe (a shorter version of the same truck) both with and without this trick suspension, I can say that its effect is even more pronounced in a back-to-back comparison. The LTZ is a $71,000 vehicle before options (Suburban’s base price is around $52,500), but it’s nearly worth that for this suspension alone. Other standard kit in LTZ trim includes heated and ventilated front seats, heated second row seats, power-folding second- and third-row seats, intelligent keyless entry, electric steering column adjustment, heated steering wheel, power-adjustable pedals (these come in mid-level LT trim, too), front and rear park assist (a backup camera is standard in all models), Xenon headlights, auto-dimming side and rear view mirrors, and a 10-speaker Bose stereo. As good as the suspension is at suspending the laws of physics, the truck’s ample mass reveals itself in other ways. The sole engine available is a 5.3-litre V8, rated at 355 hp and 382 lb-ft of torque, and while it has no trouble moving the Suburban at a relaxed pace, it works hard at wider throttle openings. Three tons, remember? Fuel consumption is estimated at 15.4 L/100 km (city) and 10.8 L/100 km (highway) (impressive numbers given Natural Resources Canada’s more stringent five-cycle test, which applies to all 2015 models). However, the reality of moving this much truck around is more like 17.0 L/100 km in the city, even with a light right foot. That said, the truck’s informative trip computer says that my tester had, at some point, done as well as 9.4 L/100 km, presumably in relaxed highway driving. We tested the Suburban’s carrying capacity a couple of times: once with a flat-packed Ikea sofa (two large boxes fit handily, along with two passengers); and again, with a shipment of donations headed to the food bank (which started out piled five-and-a-half feet high on a skid) that also fit easily, though we suspect that load came close to maxing out the truck’s 782-kg (1,725 lb) payload. I didn’t have an opportunity to test the Suburban’s towing capacity, but Chevrolet rates that at 3,765 kg (8,300 lb), or a little less with four-wheel drive. There’s not much clearance under the open tailgate; even at five-foot-seven, I instinctively ducked every time I had to load or unload. 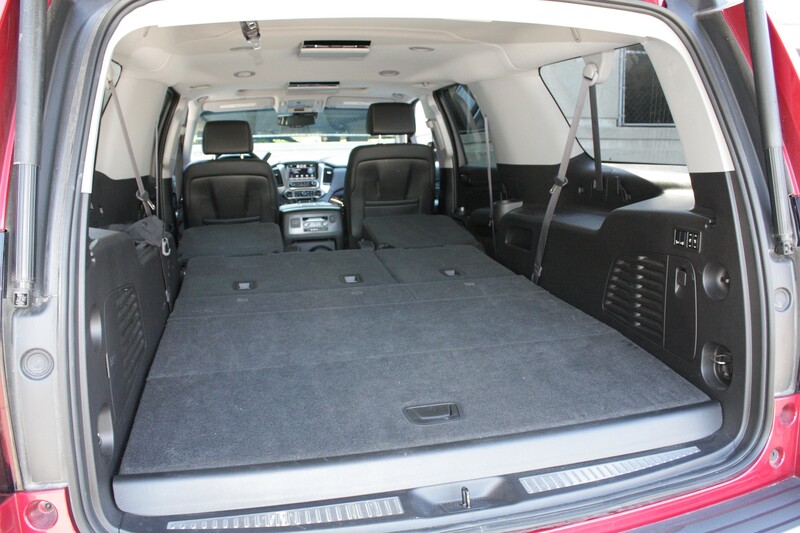 Yes, that was with the power tailgate (standard in LT and LTZ models) set to open all the way; it can be toggled to open just three-quarters of the way for loading in confined spaces, like a low-ceilinged parkade. For anyone accustomed to how “badly” large trucks traditionally go over the road, the Suburban will be a pleasant surprise. Certainly, much of that is owed to the engineers behind the magnetic ride control suspension, but it’s easy to see how, even without it, this truck would still be a manageable and, dare I say, pleasant vehicle to use, in spite of its size. During the course of the week, many people asked me who buys such a “ridiculous” vehicle. Well, families like my old school friend’s, I told them. 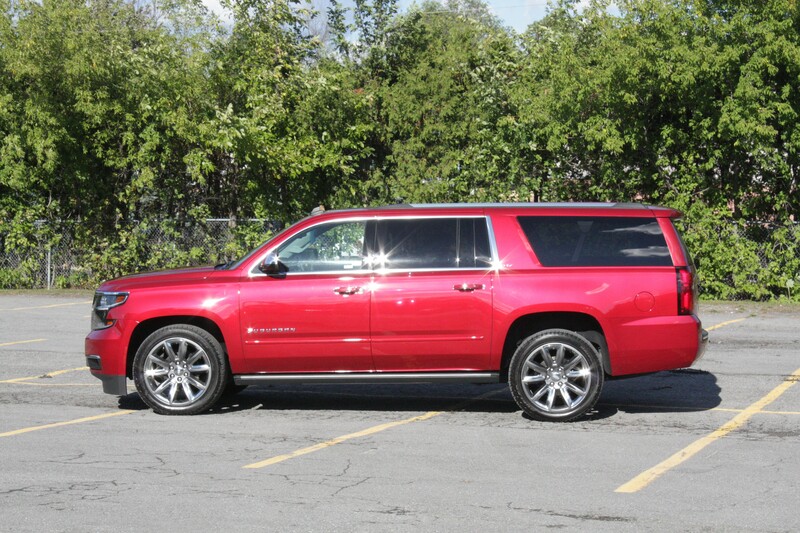 There are many vehicles that can tow large trailers, and many others that can move five people in comfort, but the Suburban is one of a rare few that can do both. If I was amazed back then by the Suburban’s sheer size, I’m even more impressed with how easy it can be to live with one—even if I don’t have three kids and an RV to haul around. This article previously appeared in the Montreal Gazette. 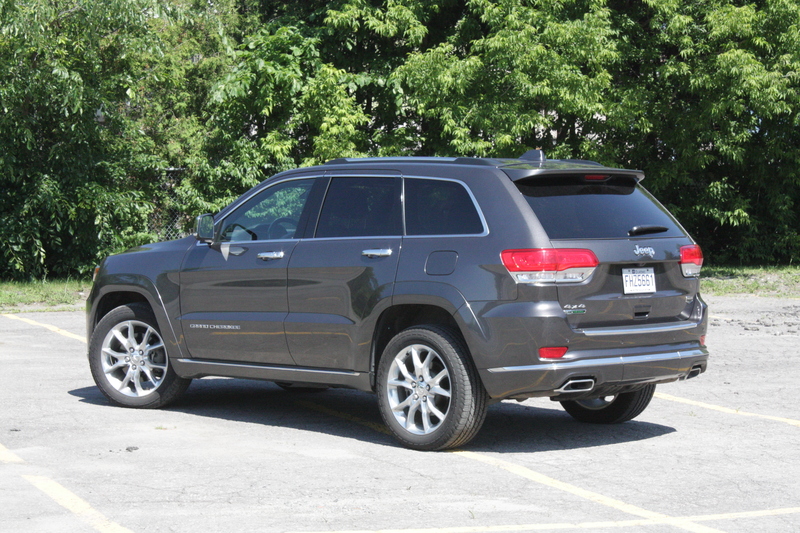 The Grand Cherokee has been Jeep’s flagship model since1993. A starting price of about $40,000 makes it affordable for a comfortable, capable SUV, but that number reaches well north of $60,000 in Summit trim, and that doesn’t count the hip-hop video-worthy high-performance SRT-8 model. With its optional 3.0-litre diesel V6, the Grand Cherokee is the only American-branded SUV offered with a diesel engine. That puts it in the same league as some pretty fancy competition, like the Mercedes-Benz ML-Class, Audi Q7, BMW X5, Volkswagen Touareg, and Porsche Cayenne. 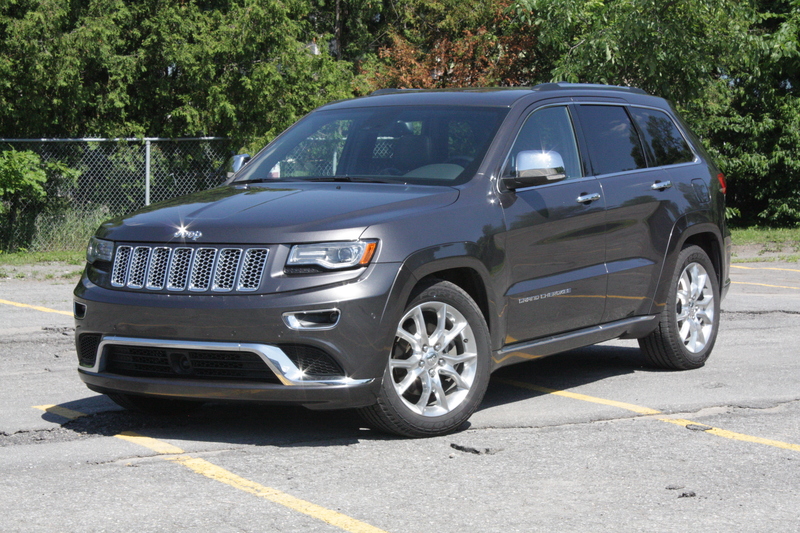 My test vehicle averaged 10.5 L/100 km in city driving, a solid 25 to 30 per cent better than you could expect from the Grand Cherokee’s base gasoline V6, and about equal to a six-cylinder family sedan. Modern diesels are known for their quiet, smooth performance. 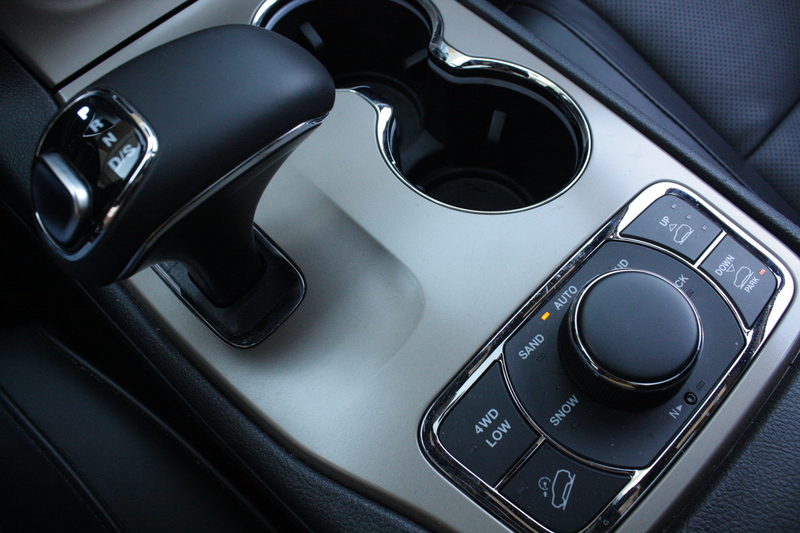 Jeep’s is quiet on the outside, but from the driver’s seat, it feels a little rougher and more truck-ish than most. 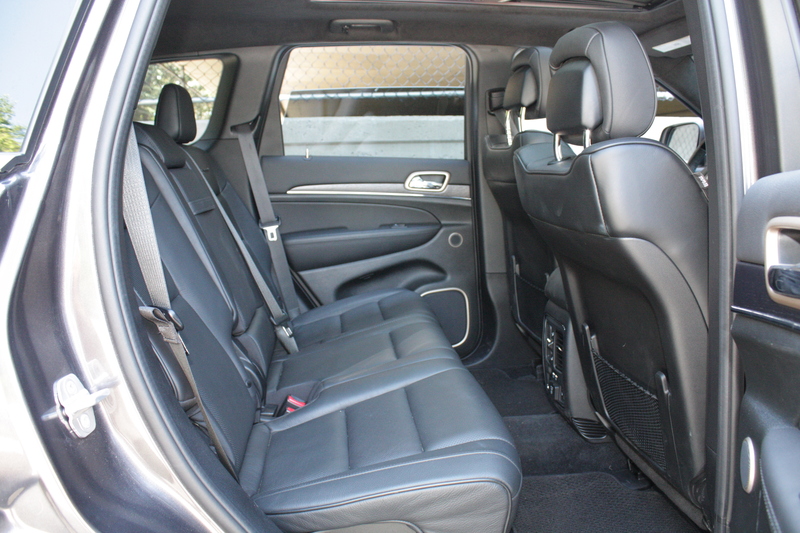 There’s less space inside the Grand Cherokee than its commanding exterior presence suggests. Hyundai’s Santa Fe is smaller on the outside but, subjectively, is about as roomy inside as the Jeep. Pair the Quadra-Drive II 4WD system (the most capable of the three on offer) with the optional height-adjustable air suspension (my test vehicle had that, too), and you’ve got a luxurious truck that could go just about anywhere, if not for the tires obviously biased toward mall parking lots. 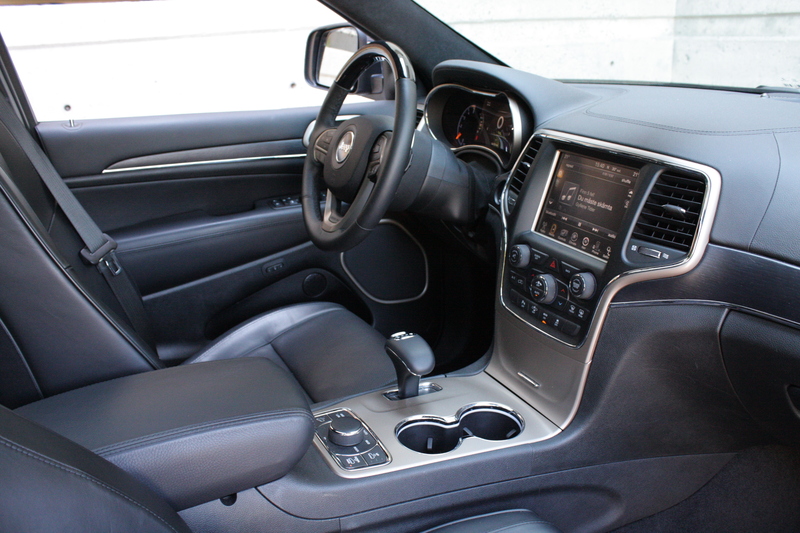 Jeep uses a thin-film transistor (TFT) instrument panel in the Grand Cherokee, a technology that’s becoming common in upscale vehicles. 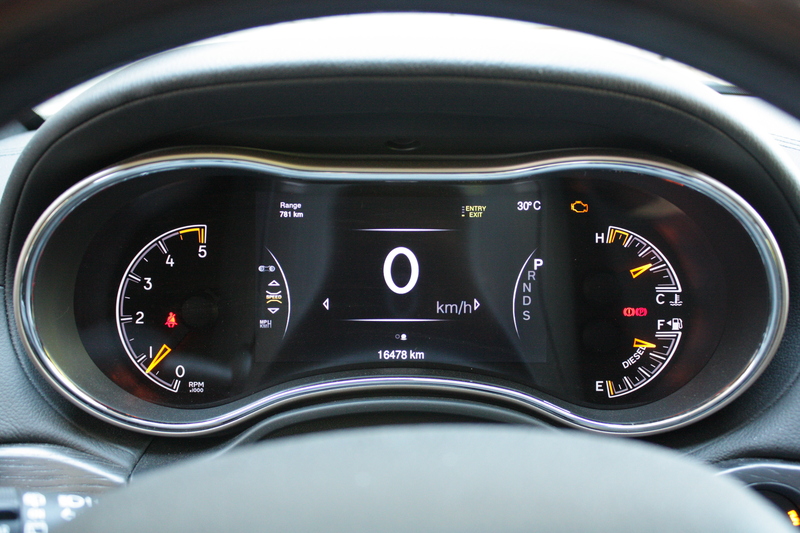 It allows a customizable gauge display, and in this case can be toggled between a digital speedometer and a representation of an analog gauge. 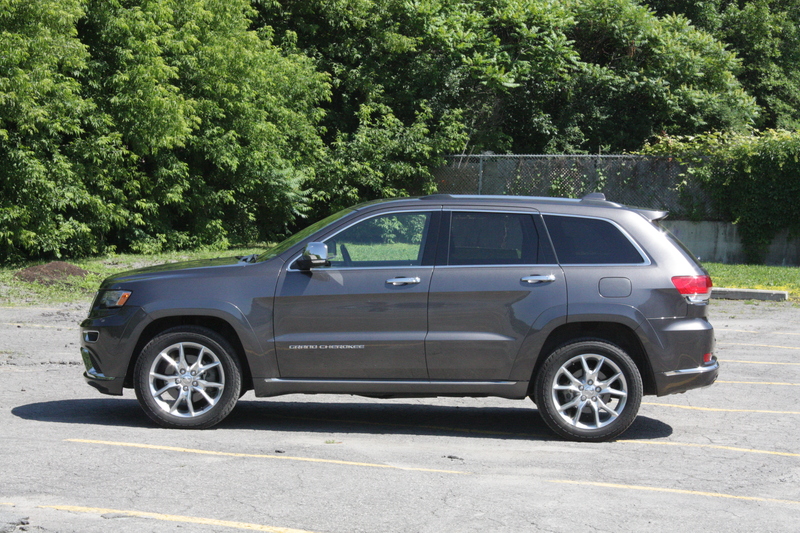 The Grand Cherokee you see here costs nearly $70,000. So does the diesel version of Porsche’s Cayenne SUV. That’s a lot of money no matter what, but the phrase “$70,000 Porsche” has a much different ring to it than “$70,000 Jeep,” don’t you think?